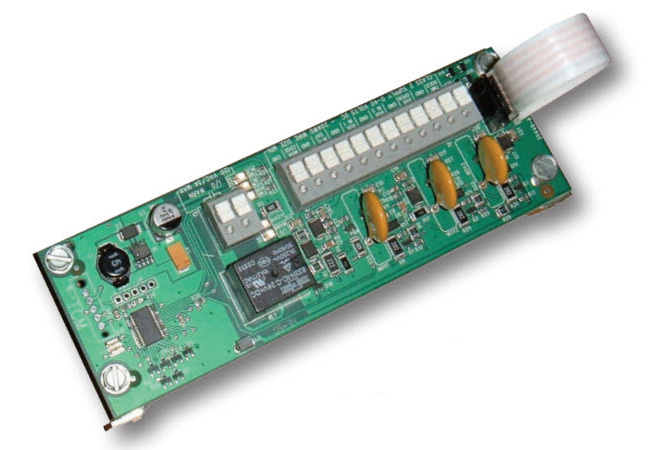 Easily expand the features of your commercial operator with an optional Timer to Close Module board. The Timer to Close Module provides an automatic door closing feature that is easily installed and automatically recognized by the operator system. Impending operation warning – Relay contacts to close 2 to 10 seconds prior to door closing. To start a timer hold: Connect this input to ground (GND) via an optional device. To start an auxiliary open: Momentarily connect this input to ground (GND) via an optional device. This input will reverse a closing door or prevent an open door from closing. This option is selected from a menu on the commercial operator control board. To initiate a normally closed reverse: Momentarily disconnect this input from ground (GND) via a normally closed reversing device. To initiate a monitored edge sensor reverse: Momentarily connect this input to ground (GND). Voltage - nominal 24V DC via the expension port. User interface – one 12 position and one 2 position terminal block. Max Wire Size – 12 AWG, min wire size 20AWG – stranded wire.